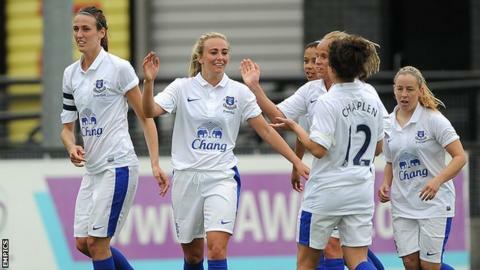 Everton Ladies manager Andy Spence says the club's men's team are a good example to follow as they begin their FA Women's Super League campaign. The men's side are chasing a spot in next season's Champions League. The Blues finished fifth in the WSL in 2013 but have lost England internationals Jill Scott and Toni Duggan to Manchester City Women. "It's all about opportunities. If some players move on, it creates new ones for someone else," said Spence. He told BBC Radio Merseyside: "Those opportunities, in the main, have presented themselves to young players. "As has been well documented with the men's team, when you give young players an opportunity, generally they play with no fear and they want to grasp it with both hands. "There were spells last year when some of the opportunities they did have, they really did take them on. All I've asked is that we build on that. "Some of the senior players are fantastic role models for the younger players we've got. It's an opportunity for them as well to step up and take the responsibility of leading, in many respects, a new team into an exciting era." Everton's men began the season with a new manager in Roberto Martinez, replacing David Moyes, who had spent more than a decade at Goodison Park. With the help of emerging talents such as Ross Barkley, John Stones and Seamus Coleman, the Spaniard has guided the club to fifth in the Premier League. They will overhaul fourth-placed Arsenal and qualify for the Champions League if they win their remaining five fixtures. Spence's side begin their top-flight campaign on Wednesday with a trip to Birmingham City Ladies, who are semi-finalists in the Women's Champions League. "It's potentially one of the toughest fixtures you'll face in a season," he added. "They make their home ground a difficult place to go for teams. "We need to put in a performance that sets the tone for the rest of the season and shows we can be a progressive and winning team."